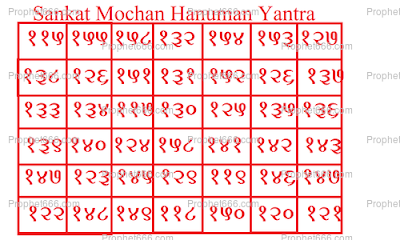 Any Sankat Mochan Yantra of Hanuman is extremely powerful and most effective as per Hindu Tantra Shastra. 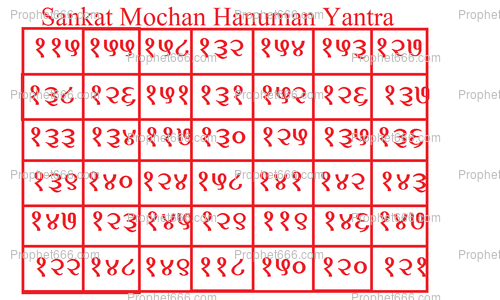 There are quite a few Yantras of Hanuman available, the one , which, I have described in this post is a Yantra comprising of most powerful numerological configuration, Each one of the numbers given in this Yantra have their own purpose and meaning and serve a particular purpose. Given below in this post is the method of preparing and worshiping this Sankat Mochan Hanuman Yantra. The Hanuman Yantra can be prepared on any auspicious Hindu Tithi, festival, Grahan Kaal or any Tuesday, which is better day to worship Hanuman. The Yantra should be drawn on a Bhojpatra, using the paste of either Yaksha Kardam or Ashtagandha with a pointed wooden stick. The Sankat MochanYantra should be kept in the Puja Place in the home and faithfully worshipped every day by offering it Dhoop/Diya. This Yantra removes all kind of Klesh and gives Klesh Mukti, no matter how powerful the hardship, pressure or danger from known, unknown or mystical and ghostly sources. It is also better to chant any Stotra or Mantra of Hanuman everyday or if it is not possible every day, then at least on Tuesdays. Hope you can help. What can i replace in place of Bhojpatra,Yaksha Kardam or Ashtagandha. We cant find here in africa. The Yantra caan be prepared tomorrow, but the preparation menthod given by me in the post is as per the Tantra. Bhojpatra can be replaced by plain white paper, the other items can be replaced by red ink. Dear Sir please advise if we replace the items with paper and red ink from the mentioned post would it effect the potency of the yantra. The Yantra making procedure has been given in the post, if unable to find these items, then you could replace them with white paper and red ink. It should not in my opinion reduce the potency of the Yantra. Sir, I had prepared the tantra as advised by your good self and had worshipped daily as per the post. Very unfortunately my respected father passed away on 15 August 2015 due to kidney problem on account of which he was on dialysis for more than 2 years. Due to this reason , patak period, there has not been any lighting of lamp or puja upto today. Has my yantra be effected on account of this or after puryfying the puja place, and restarting of puja, it is OK in that sense ? You can recommence the Yantra Sadhana after the - Teravih Shradh or the Thirteenth Day Ceremony, which is the generally acceptable period when the Lamp can be lit after cleaning the house. The Yantra or any other Mantra Sadhana will not be adversely affected due to the discontinuation of the rituals as this is the established practice in the traditional Hindu religion. Numbers English me likh sakte hai? Yes, you can write the numbers in English. Can we keep this in locket & give to someone for protection? Also, before that how do we energize & then re-energize it? It is better to keep in the puja place or any other clean place, you can give it to any person, the simple Vidhi is mentioned in the post, that is all that should be done.